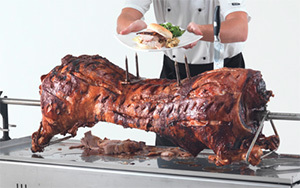 Are you looking for a hog roast catering service that covers the South London area? Then look no further – your search is over! Hog Roast South London is proud to provide you with a superior hog roast catering service where beautifully prepared and cooked hogs are spit-roasted in front of your guests’ very eyes before being expertly and professionally served up. With full stomachs all round, your guests will be more than impressed with the feast that has been provided by Hog Roast South London! Our team of professional chefs and experienced servers are capable of catering for any event, from a small BBQ to a large corporate affair. So whether you are expecting three or three hundred guests, we can help you to tick the catering box off your ‘to-do’ list for your event. Without having to worry about the catering, you are free to concentrate on the other elements of organising your event. A hog roast makes an impressive centrepiece for a wedding meal and is generally a lot easier to serve in comparison to other types of wedding buffets. In addition to the expertly prepared and roasted hog, your guests will be treated to an extensive selection of side dishes that will perfectly complement the main dish. You can choose from an alfresco wedding meal with the full hog roast with all the trimmings or perhaps you would rather an evening BBQ complete with pulled pork buns, gourmet sausages and handmade beef burgers. Just let us know what it is you want and we can help! Have you always dreamed of trying your hand at spit roasting a magnificent hog to the amazement and admiration of your guests? Hog Roast South London can make your dream a reality with the provision of a hog roast machine, a delicious hog, gas bottle and everything you need to host a successful and memorable event. We will then arrange for the collection of all equipment from your venue whether it is clean or dirty. Call us today for more information on our fantastic hog roast machine hire packages, all of which can be personally tailored to your requirements!